NEW YORK, NY—Dark Horse Deluxe, an imprint of Dark Horse Comics, has revealed the latest figure in an ongoing series of characters from the critically acclaimed HBO® series Game of Thrones®: the Night King. 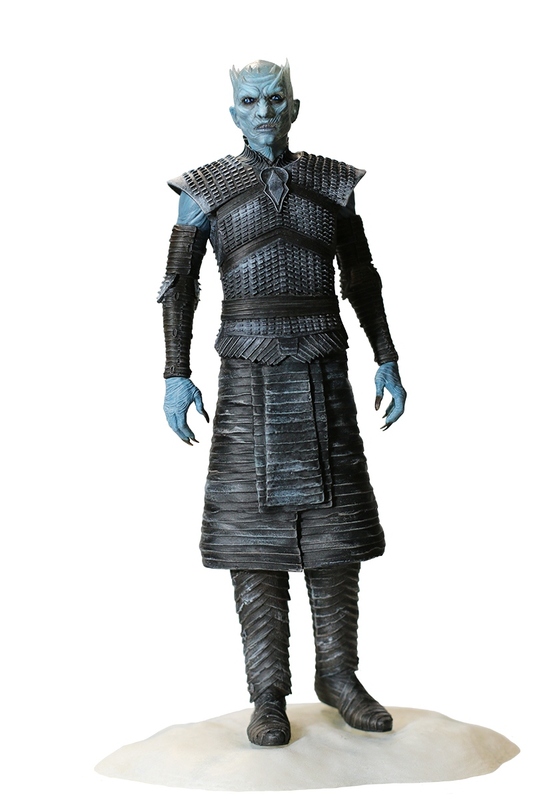 The masterfully sculpted figure finely details the leader of the White Walkers. It measures eight inches in height and is packaged in a collectors’ window box. “The Night King’s confrontation with Jon Snow in the aftermath of the Hardhome battle is one of the most dramatic moments of Game of Thrones to date. We are very excited to have captured the power of this character in a stunning new figure,” Dark Horse Product Development head David Scroggy remarked. Response to the Game of Thrones collectible figure line has been overwhelming, and additional characters are in development for release in summer and fall 2016. The Night King figure will be joined by Ygritte, Margaery Tyrell, Oberyn Martell, Grey Worm, and Varys. Dark Horse also recently announced a limited-edition bust statue of the Night King, which will be released in March 2016. Game of Thrones figures have a suggested retail price of $24.99 and are packaged in deluxe window box packaging. Visit Dark Horse at Toy Fair 2016 Booth 4845.